·	N82/1 Vehicle power supply control unit. Model 221 has a two-battery electrical system, consisting of a starter battery (G1/4) in the engine compartment and an on-board electrical system battery (G1) in the trunk. The task of the starter battery (G1/4) is to provide the energy required for the starting procedure and to supply the on-board electrical system when it is in emergency mode, i.e. when the on-board electrical system battery (G1) is discharged (voltage < 9 V). The on-board electrical system battery (G1) supplies all the electrical consumers in the vehicle, even when the vehicle is idle. When diesel engines are cold started, the on-board electrical system battery (G1) is used to assist the start. The on-board electrical system, the starter battery circuit and the on-board electrical system battery circuit are separate in order to preserve the starting ability of the vehicle. The on-board electrical system in model 221 is managed by the vehicle power supply control unit (N82/1). It uses the measured voltage and temperature values to evaluate the state of the battery and initiates measures to stabilize the on-board electrical system if necessary (e.g. consumer shutoff). 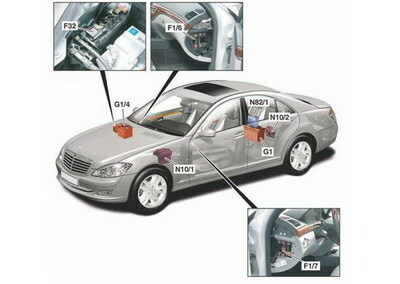 • When the vehicle is opened and the transmitter key (A8/1) is inserted in the EIS [EZS] control unit (N73), the chassis CAN is woken, thereby waking the vehicle power supply control unit (N82/1). The quiescent current cutout relay (N82/1k1) is closed if it was previously opened due to the battery state (voltage < 11.8 V) or due to the timeout (t > 6h). • During the starting procedure the on-board electrical system battery circuit and the starter battery circuit are electrically isolated from each other. The starter battery (G1/4) guarantees the starting of the engine, while the on-board electrical system battery (G1) supplies all the electrical consumers in the vehicle. In diesel vehicles the battery coupling relay (F32k1) is closed at an engine oil temperature < -10 °C in order to provide the increased energy requirement by connecting the starter battery (G1/4) and the on-board electrical system battery (G1) in parallel. When the engine is running, the battery coupling relay (F32k1) opens again when 30 s have elapsed. • After the engine start, the vehicle power supply control unit (N82/1) controls the charging of the starter battery (G1/4) for 1 h via the charge converter, depending on the charge level, at maximum value 25 W (corresponds to approx. 2 A depending on the state of charge), even if the vehicle has been switched off again in the meantime. • At "Engine OFF" (circuit 61 "OFF") and subsequent "Ignition ON" (circuit 15). • Voltage of on-board electrical system battery (G1) < 10.5 V (at "Ignition OFF"). • Battery coupling relay (F32k1) closed. • If the voltage of the on-board electrical system battery (G1) is < 9 V, the on-board electrical system switches to emergency mode. If the vehicle cannot be unlocked using the transmitter key (A8/1), the driver door should be opened with the manual key. • When the transmitter key (A8/1) is inserted into the EIS [EZS] control unit (N73), a microswitch in the EIS [EZS] control unit (N73) is closed, which closes the battery coupling relay (F32k1) in the front prefuse box (F32). In vehicles with KEYLESS GO the microswitch is closed by pressing the Keyless Go start/stop button (S2/3). 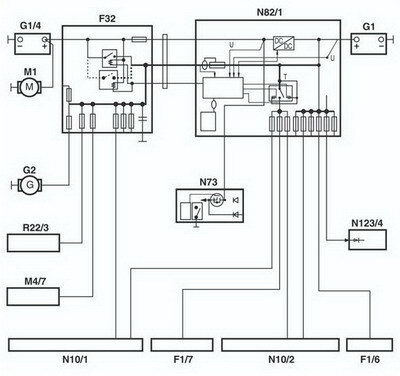 • When the battery coupling relay (F32k1) is closed, the starter battery (G1/4) and the on-board electrical system battery (G1) are connected in parallel for a period of 5 min, in order to provide sufficient energy to start the engine. • If the transmitter key (A8/1) in the EIS [EZS] control unit (N73) is turned to "Ignition ON" (circuit 15), the coupled energy supply is only available for starting the engine for a period of 30 s.
The time is reduced from 5 min to 30 s on "Ignition ON" because many more control units have to be supplied with energy when circuit 15 is on. If the engine has not started by the time the 30 s have elapsed, the battery coupling relay (F32k1) is opened again. Then the transmitter key (A8/1) must be inserted again in order to start the vehicle. The battery coupling relay (F32k1) remains closed for the entire duration of the subsequent driving cycle. 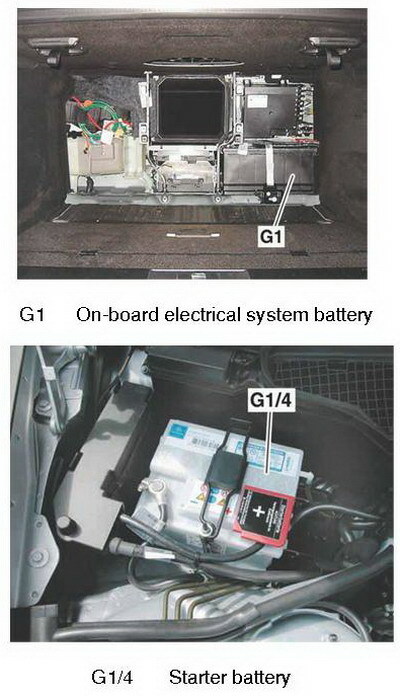 The on-board electrical system battery (G1) is located behind the partition wall between the passenger compartment and the trunk on the right hand side in the trunk. 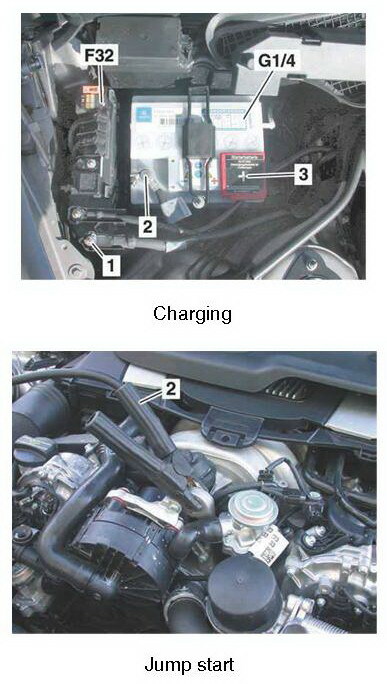 The starter battery (G1/4) is located beside the air intake of the air conditioning system on the right at the rear of the engine compartment. Due to the high power requirement of model 221, only use Daimler-approved chargers with a charging current of at least 30 A. • Connect positive clip of charger to connection stud (1) on front prefuse box (F32). • Connect negative clip of charger to negative terminal (2) of starter battery (G1/4). • Connect positive clip of charger to positive terminal under cover (3) of starter battery (G1/4). cover of starter battery (G1/4). ground (e.g. engine block lifting lug). In vehicles with Keyless Go (code 889), press the Keyless Go start/stop button (S2/3) repeatedly until the ignition is switched off. Remove the transmitter key (A8/1) from the vehicle and keep it outside the range of the transmitter (at least 2 m). Before the on-board electrical system battery (G1) or the starter battery (G1/4) is disconnected from the on-board electrical system, the internal on-board electrical system functions (e.g. battery coupling relay (F32k1), charge converter) must first be terminated. • Engage selector lever position "P". • Switch off all electrical consumers. • Turn transmitter key (A8/1) in EIS [EZS] control unit (N73) to position 0. • Turn transmitter key (A8/1) in EIS [EZS] control unit (N73) to position 2 (ignition "ON") and wait 30 s.
• Turn transmitter key (A8/1) in EIS [EZS] control unit (N73) to position 0 and leave it in the EIS [EZS] control unit (N73).